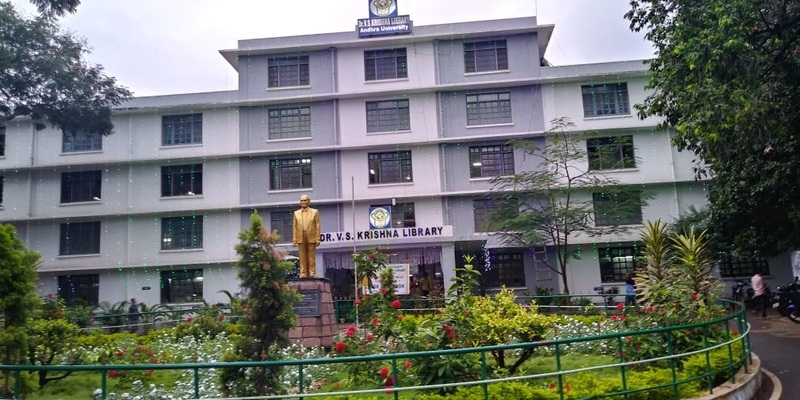 The Andhra University Library was started in the year 1927, renamed as V.S.Krishna Memorial Library in 1968 as a mark of respect to the former Vice-Chancellor Dr. V.S.Krishna. The Library has two branch Libraries, one in Engineering College and other in Law College.The total plinth area of the building is about 60,000 sqft.The main functionaries of the Library are the Circulation, Periodicals, Reference, Acquisition, Binding and Technical sections apart from the Administrative and Computers sections. The Library has huge collection of books apart from important journals , microfilms, paper and palm leaf manuscript. The Library has been serving the academic and research community over years and presently it is serving more than 17,000 users. Access to e-journals is also made available to the campus academic community through UGC infonet programme. 10/11/2018 :: National Library Week - 2018 from 14th to 20th November, 2018. All the above e-journals can be accessed from URL https://ess.inflibnet.ac.in/ of UGC-INFLIBNET, by searching alphabetically, subject wise and publisher wise, within the campus computers IP range. List of E-Journals Subscribed for the year 2018 by Andhra University. To help the students and teachers to reach their full potential by providing multifaced, supportive learning and teaching environment. To enhance Andhra University status as a major research university and center for higher education. To position the University as the leading provider of outreach services in collaboration with other institutes of higher learning and research to users on and off the campus. To provide global access to information published worldwide in many disciplines in support of qualitative research and education at the University level.